At least 20 million Americans have been diagnosed with irritable bowel syndrome or IBS. The drug companies are beginning to tap into this hefty target market by offering medicines aimed at relieving the symptoms of IBS. These medications are highly profitable. They alter the physiology and ultimately the action of the digestive tract, but they do not address the underlying causes of IBS, or even claim to cure IBS. Taking medications also comes with an alarming variety of warnings and side effects. IBS is caused by any numbers of issues with the digestive tract and/or immune system. Doing the right testing can identify the cause and enable the patient to cure their IBS rather than just temporarily treat the IBS symptoms like diarrhea, constipation, cramping, etc. The typical medical approach for treating IBS involves ruling out other problems and then either doing nothing, or guessing at the problem and trying different medications. Many of the patients that come to the IBS Treatment Center have been on numerous medications, none of which has solved their problem. Drugs change how you experience IBS by forcing changes in the biochemistry of your body, sometimes providing temporary relief. Drugs rarely cure IBS because it is not caused by a drug deficiency. Treatment with these drugs does not address the cause of your IBS, and once you stop using the drugs, the symptoms generally return. Research continues on IBS medications, but this is not a meaningful approach for an umbrella diagnosis like IBS. There is no single cause for IBS, and there will never be just one treatment that works for everyone. More concerning, the use of these drugs often results in serious side effects and/or negative long-term consequences. We at the IBS Treatment Center often feel the same way about supplements that we do about prescription medications. Patients may use nutritional supplements to mask or suppress their IBS symptoms in the same way as meds. Fortunately, supplements generally have less of a downside then medications, however, some patients may be spending hundreds of dollars a month on supplements and not realizing any significant benefits. Supplement certainly have their place, and can have great benefits when used properly. Our goal is to help patients prioritize what supplements are most needed and eliminate those that are not. That includes finding the highest quality products available, using them in the proper dosage, and targeting the right products for the right problems in the right patients. Doctors may use several types of drugs to treat the different symptoms of IBS. Reglan is a drug that increases muscle contractions in the upper digestive tract, which will speed up the rate at which the stomach empties into the intestines. It may be used for reflux or for motility disorders. It is not intended to be used long term and is not a cure for IBS. Most people who take Reglan experience drowsiness. Other side-effects include diarrhea, depression, low blood pressure, and fatigue. Viberzi is a newer drug for treating diarrhea and abdominal pain. You might recognize the ad for this drug on TV that has a girl in a skin-colored body suit with an image of her digestive tract and she is following around an IBS sufferer. In spite of the happy ad, it does not cure diarrhea. Side-effects include worse abdominal pain, pancreatitis, constipation, nausea, and upper respiratory infections. Fiber supplements and laxatives are usually the first things doctors recommend to treat constipation. Laxatives do not cure constipation, and the longer you use them, the more difficult it is to get by without them. Laxatives should only be used very temporarily and sporadically at the most. If you need laxatives in order to have a bowel movement, then you have IBS and would be better served to find the cause of the problem and eliminate your need for laxatives as soon as possible. Linzess is a popular, well-advertised medication used in the treatment of constipation. It can cause diarrhea, abdominal pain, heartburn, vomiting, gas, bloating, headaches, and cold symptoms. Zelnorm worked similarly and was taken off the market because of the high risk of heart problems and other severe side effects. Amitiza works by increasing fluid in the small intestine to help with the passage of stool. It has many side-effects, including nausea, diarrhea, headache, urinary tract infection, abdominal pain, sinusitis, dizziness, vomiting, abdominal distention, and flatulence. Many drugs, both over-the-counter and prescription, treat the symptom of diarrhea, but do not get to the root cause of IBS. Imodium, Maalox and Kaopectate are the most commonly-used over-the-counter treatments for diarrhea. They are just as effective, if not more effective, than most of the prescription medications available on the market, but they do not cure diarrhea. They only provide temporary relief of the symptom of diarrhea. There can be risks when taking it long term. Loperamide is an opioid medication, and therefore there is potential for abuse. We strongly recommend against using it long term. Dicyclomine is an antispasmodic drug used for diarrhea. Potential side effects include constipation, nausea, bloating, lightheadedness, weakness, blurred vision, and dry eyes. Lotronex may be used by women with diarrhea. It has serious potential side-effects, including bloody diarrhea, abdominal pain, constipation, bloating, gas, and nausea. This drug is made in El Salvador and the FDA has issued a warning about it saying it can interfere with your body’s ability to make critical red and white blood cells. Taking this drug can lead to serious health problems and for high-risk persons, even death. Cholestyramine is a medication that binds bile. It is sometimes used in IBS patients who have problems with their gallbladder. It may help with certain types of diarrhea, but it is not a cure for most types of IBS. Stomach cramps or abdominal spasms are key symptoms of IBS. They are usually in the lower half of the belly and sometimes get worse after meals and feel better after a bowel movement. Librax is a combination of two medications to treat abdominal cramping. One is an antispasmodic and the other is a psychoactive benzodiazepine for treating anxiety and depression. Side-effects include constipation, bloating, nausea, dizziness, and weakness. The side-effects can be worse than the original symptoms. 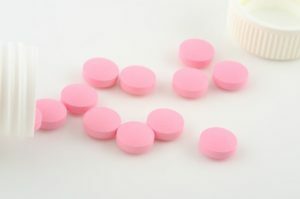 Antidepressants are often prescribed by doctors for IBS. There is a theory that IBS is caused by poor regulation of neurotransmitters in the relationship between the brain and the significant neural network in the gut. This is an intriguing theory, but it has not been proven, and any poor regulation of neurotransmitters in the gut is not caused by a lack of antidepressant medications. Brand names of these medications include Celexa, Wellbutrin, Prozac, Paxil, Nortriptyline, and Zoloft, among others. They don’t cure your IBS. Proton Pump Inhibitors or PPIs shut down the production of stomach acid. They are not designed for IBS, but we have seen so many patients who have been put on PPIs by other doctors that we must address them here. PPIs might make your IBS worse. PPIs are also not designed to be used longer than 8 weeks, and they come with a variety of side effects, such as gas, abdominal pain, constipation, heartburn, diarrhea, reduced bone density, increased Clostridium difficile infections, pneumonia, and yeast overgrowth in the digestive tract. Long-term use of the drugs can make it difficult to absorb some nutrients. Some doctors prescribe antibiotics to kill bacteria in the gut, which they think may be the cause of IBS. This theory has merit for some people with IBS, but using antibiotics is generally not the best way to treat the problem. In fact, it’s often why the problem was created in the first place. Rifaxamin is an antibiotic being used to treat Small Intestinal Bacterial Overgrowth (SIBO) which has similar symptoms to IBS. Rifaxamin extremely popular in the IBS world lately and is supported by lots of advertising. It is not better than other antibiotics, and it does not kill all types of bacteria. It can also kill helpful bacteria in your gut. Enzymes may or may not be helpful for treating IBS. Many are available over-the-counter, but one is by prescription only (and it isn’t any better than many others that don’t require a prescription). Creon is a prescription enzyme. We carry non-prescription enzymes that are exactly like Creon, or even stronger than Creon, and we carry many other types of enzymes as well. At the IBS Treatment Center, we rarely use any of these medications. Other than antibiotics for bacterial overgrowth, the medications listed above have clearly demonstrated their inability to cure IBS. Even worse, almost all these drugs have the potential to cause the symptoms of IBS. Our goal is to end IBS symptoms for the long term. To do this, we work to find the true cause of a patient’s problem, not just treat the symptoms. Once we find the underlying cause of the IBS, we can treat it and the symptoms will end, not just be masked by the quick fix of a prescription. After treatment at our facility, most of our patients are ultimately able to discontinue the use of any previously prescribed medications. It is usually a natural transition for a patient to cut back on the meds as they heal and begin to feel better. Without the symptoms, the need to suppress them with medications disappears. Unfortunately, IBS is a complex disorder with a variety of symptoms and causes. There is no one-size-fits-all cause or cure for IBS. Finding your cure requires an experienced medical expert like those at IBS Treatment Center who will spend the time to understand your unique situation and work with you to find the right treatment plan.